Just 'cos you can, does it mean you should? Story is not Just Cause 2’s strong point, and that’s putting it mildly. You play as the returning Rico Rodriguez, complete with a handy grappling hook and unlimited supply of parachutes, and you quickly find yourself placed in the middle of a turf war between separate guerrilla factions and the ruling military forces of a fictional island. Your main objective is to complete missions for ‘the Agency’, although you spend most of your time aiding the different factions on the island and blowing up military facilities. It is, of course, a non-story. That’s not necessarily a bad thing per se, except that here, repetition is commonplace and undermines the sense of self deprecating light heartedness that would redeem an otherwise poor story. You progress the story by unlocking missions that you complete for the separate factions on the island and for the Agency. Missions are unlocked using a ‘Chaos’ experience system, whereby you gain experience for causing Chaos (‘Chaos’ being defined here as anything from completing the different faction and Agency missions already available to you, to blowing up government facilities, vehicles and aircraft). The drawback is that if you wish to progress the main storyline, you’ll need to complete a lot of faction missions, and these tend to feel repetitive almost straight off the bat (Agency missions, on the other hand, are much more inventive and enjoyable). Combine that with paltry amounts of experience for causing random acts of destruction, and the Chaos system can become a grind, rather than a compelling reason to continue to play the game. 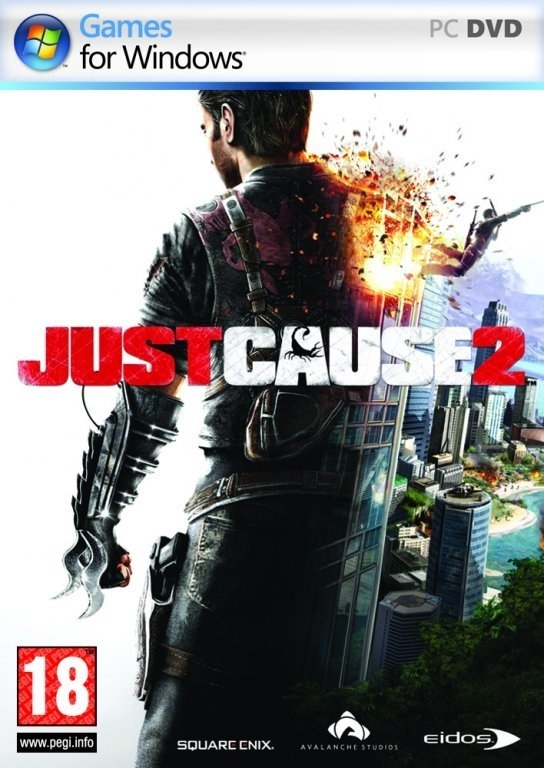 Just Cause 2’s gameplay tends to shine more when it’s trying something a little bit different – combat using the grappling hook can be great fun, and encourages you to experiment with different methods of taking out enemies. Grapple someone to a passing truck, for example, and he’ll get pulled along to his death like a ragdoll, or take to the rooftop of a moving car and grapple pursuing enemies to the tarmac, causing their vehicles to fly through the air. 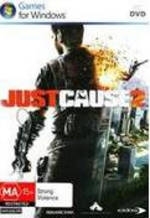 At a more basic level, Just Cause 2 can be subpar – enemy troop variety and AI is extremely limited, and the shooting combat feels average at best. Additional weapons and vehicles can be bought from a black market arms dealer, who can also extract you from most locations; if you find yourself stranded a long way from civilization, you can effectively fast travel to an already explored area. Or better yet you can purchase one of the many different types of aircraft and travel to your destination on your own accord, then jump out of your ride and plummet to the earth below, before finally opening your parachute. Combine the parachute with the grappling hook, which can grapple on to any surface, and with practice you’ll be able to move all around the island with exhilarating ease. Can’t quite master the technique? No worries, just order a ready-made gunship so you can blow stuff up on the way to your destination instead. The entire world can be traversed without loading screens, but the island is best viewed from the sky, where you can really take in the impressive vistas. The game world is huge and locations are surprisingly varied - from bustling city centres, to sunny beaches, snowy mountains and unexplored islands, there are many sights to see and places to explore. There’s not much to do when you get there, but the sight-seeing alone is surprisingly enjoyable. Even the weather patterns are diverse; as I left one of the many sunlit beaches and headed off to a nearby island, the weather gradually changed. By the time I got there, the sky was almost black with storm clouds, rain was pelting down, and lightning was striking all around. The lightning even managed to strike the plane and sent it spiralling to earth in a ball of flames. Talking of which, the explosions and particle effects can make for quite the spectacle as well. 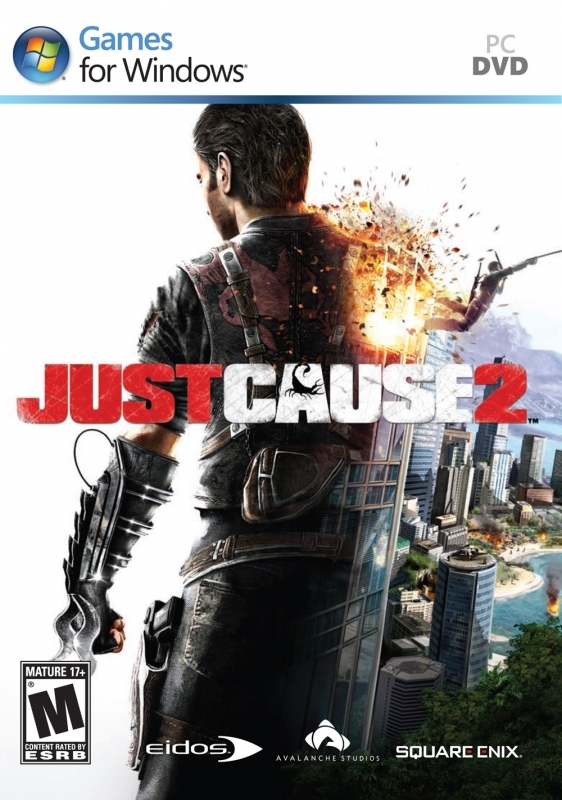 When you consider the sheer size of the game world, then, it’s clear that – graphically - Just Cause 2 is a success. Nevertheless, there are a few criticisms to make. For example, many of the military installations look identical; character models (besides Rico’s) are quite poor; the voice acting is abysmal, even if the camp overacting is intentional; and the music and sound effects are both largely forgettable. Just Cause has a lengthy campaign, although that’s thanks in no small part to the slow pace at which you’ll fill up your Chaos experience bars and the duplication of faction missions. Beyond the campaign-related missions there are also ‘challenge’ missions, which are all racing side quests. 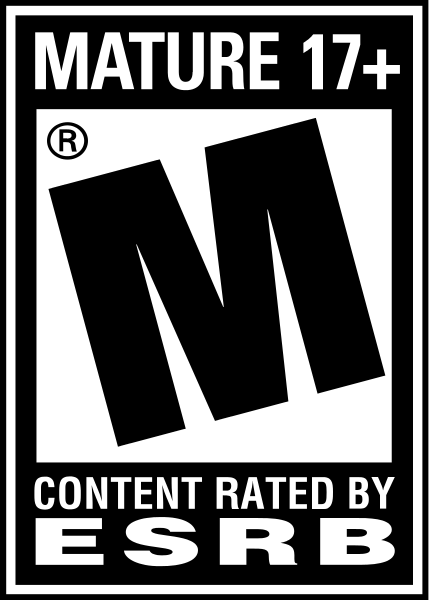 The PS3 version includes a YouTube upload feature, which allows you to record and upload gameplay clips. There are also innumerable collectibles to find, so if you aim for 100% completion of your games then you’re looking at quite a serious time commitment. 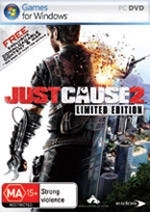 The problem is that you’ll have experienced all that the game really has to offer well before then, and whilst the breadth of different locales certainly helps to keep the game somewhat fresh, Just Cause 2 simply doesn’t offer much in the way of longevity. The irony of many open world games is that the multitude of activities you can engage in is simultaneously the game’s key strength and its key weakness. With so many places to go and things to do, you’re bound to find something you enjoy, as well as plenty you won’t, or perhaps you’ll just mess around aimlessly before eventually tiring of the experience. 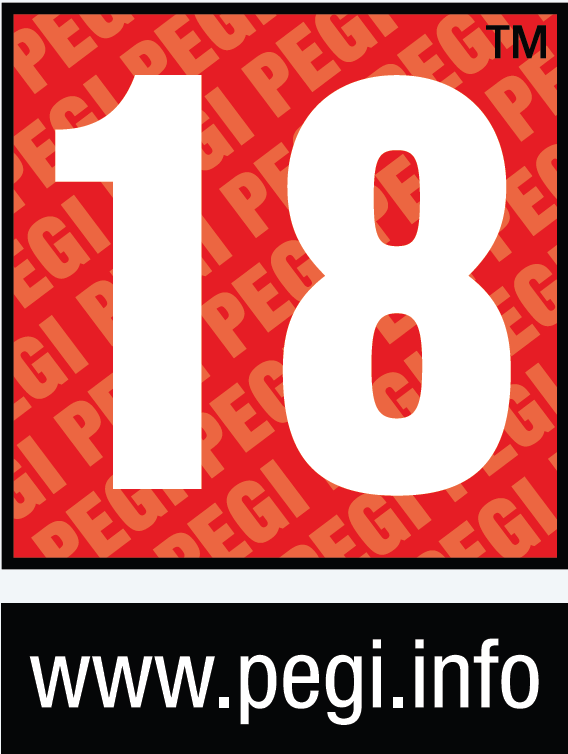 In a way, Just Cause 2 bucks the trend, but for the wrong reasons. There’s not a great deal of varied gameplay, mission structures are often regurgitated several times over and the challenge missions all boil down to the exact same thing. But there is a simple pleasure to be found in some of the activities that take you away from the identikit nature of much of the game, most of which involve the use of a grappling hook, parachute and aircraft. 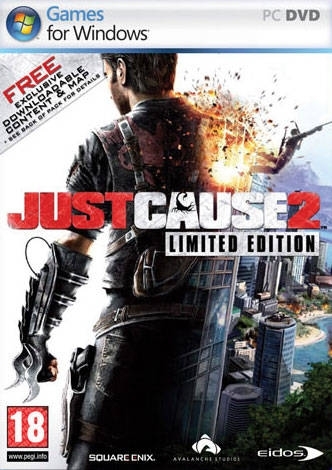 Just Cause 2 is enjoyable for those first few hours, so in that respect it is, perhaps, best suited to being a rental title.